Although I’m slightly less obsessive that previously now I’ve found you can buy this reasonably reliably at Target stores, it still isn’t generally available anywhere – convenience stores like 711 and Wawa, gas stations, supermarkets, soda and beverage distributors. Having said that, Target is running a great deal right now (I don’t know how long it will last) of 10 for $10 plus you get a $5 Target gift card. That makes the effective price $0.50/bottle which is unbelievable. I’ve cleaned out my local Target, you should do the same if you like this stuff. Quick update as of Nov 27: It’s still as rare as hens teeth but right now it’s 99 cents/bottle at participating 7-11’s! I’ve now bought enough to last me through February. I’m not posting any more on this thread as it’s run out of steam. So, here’s the letter I received today along with six bottles of the Fuji-Apple pear, by USPS priority mail. Well done, Sobe, for keeeping your word on that one. Well, it’s 5/25 and the free samples never arrived ….. so I guess I retract some of my previous comments and I’m surprised I was so easily fooled …..
On the availability front it seems to be getting worse – 7-11 has stopped stocking it, and still the only place I can find it is in Target. Still nobody delivers. There’s some guy selling it on ebay, at $12.99 for a 6 pack and about the same in shipping, so I guess you’d have to really, really like this to pay 4 bucks a bottle – the surprising thing is that people probably do! Wegmans have started listing it, but they aren’t exactly nationwide and they don’t deliver. As soon as I find someone who’ll ship or deliver it, I’ll post it – but as outlets seem to be dwindling it may be that it’s going to go out of production, It still remains a mystery. Whoah, the Lifewater folks read my blog ….. If you ever wanted a demonstration of the power of the Internet, there it is. Imagine trying to do that over the phone or by snail mail. 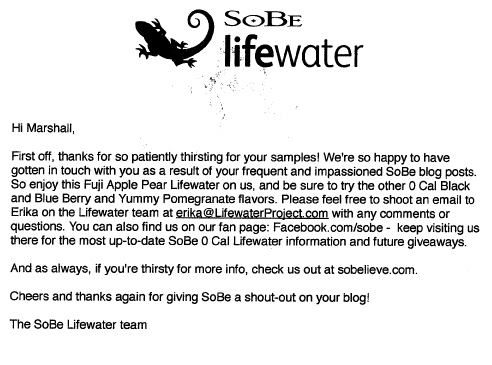 Full marks to the Sobe people for watching the web and reacting; they obviously have savvy marketing folks. And no, I’m not just saying that, in my day job I’m responsible for web sites among other things and I know how challenging it is to keep an eye on all the social media. Managed to find some at (of all places) Target. 10 for $10. Bought 40. Local Genuardi’s have buy three, get one free, but only have two on the shelf (but dozens of shelf yards of all the other flavors). Still can’t find it anywhere else except 711. The hardest Martini in the world to make …. Posted by admin on April 21, 2009 Comments Off on The hardest Martini in the world to make …. So here’s a great Martini, but it’s virtually impossible to make for two reasons: a) You can’t get ingredient number 1 and b) You will struggle to get ingredient number 2. The good news is that ingredient number 3 is freely available, the bad news is that it’s ice. Also a chilled Martini glass and a Martini shaker. Pour 50% Pravda, 50% Fuji Apple Pear into the shaker, add ice, shake 35 times, pour. It’s great. However the chances of you being able make one are really small. OK, so what’s the deal? 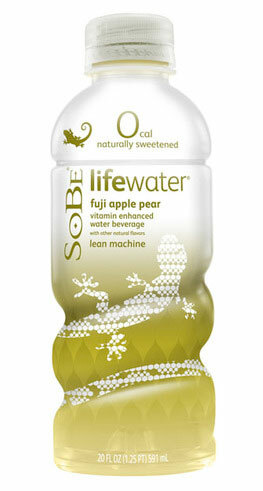 For those of you who don’t know, Sobe Lifewater is a Pepsi brand aimed at the non-carbonated non-water consumer space occupied by Vitamin Water et al. There are three varieties that are zero cal, and there’s a lot of guff about the sweetener used being natural and so on. OK, so much for the science. The reason I’m interested is that I don’t drink coffee after noon, I just plain get fed up with water, I don’t drink carbonated drinks, and I really struggle to find something I like to drink between noon and 6pm. I tried all of the different zero cal lifewaters, and this one is the only one I actually like. The first one I tried was $1.99 for 20oz from my local 7-11. Not bad. However, I want to lay in a case or two at home, and at work, and I started looking. I found 1) It’s virtually impossible to get 2) Nobody delivers it. It’s so hard to get (and if you believe the blogosphere, very desirable) that it’s even being sold on eBay. So there are only two places I’ve found around here I can get it – the 7-11 in Philly (and Ali, the owner, won’t sell it by the case or discount it) and Genuardi’s – who sell it for $1 if you buy ten but don’t actually have any. All the soda delivery companies? No chance. Coffee for less? Nope. Acme markets? (every single one except this one). Here’s the question: If this is so desirable (and I would buy several cases in a heartbeat), why can’t you buy it anywhere? Pepsi seems to be missing out here .. or do they know something I don’t?